Oxblood American Bison Leather Bases lined with luxury soft Chianti coloured Suede, with Oxblood Italian Leather Straps Restraint Cuffs For Wrist and Ankles set. The Oxblood coloured Bison exotic leather bases matched with being lined with soft chainti coloured suede in this Limited Edition cuffs set is really the very best in suppleness, but with the firmer Oxblood coloured Italian leather straps makes this a very sturdy but comfortable restraint cuff to use. Bases are cut, bonded and stitched with high strength breaking silver thread. Each base has a 1 inch wide Oxblood Italian 3mm thick leather straps which are removable running through them with a 1 inch welded dee ring and locking roller buckle. 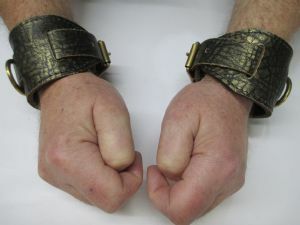 ***The Oxblood deep grained Bison leather used in this restraint cuff set is exotic and difficult to source in the UK usually, making this a very Limited Edition set. We have only a small supply of the bison leather, so if you wish for matching other items to be made please ask us about our Bespoke service***.